David Beckham Is Secretly a Lego GeniusBuilding his daughter’s 4,000-piece Disney castle was … relaxing. Anna Wintour Takes Off Her Sunglasses for One Man and One Man OnlyHere’s a good photograph. Watch John Boyega and David Beckham Have a Smiley Lightsaber DuelFence it like Beckham? Watch David Beckham Bend ThingsIt’s so soothing. People Has Discovered Our Hot Dad FetishDavid Beckham is the Sexiest Dad Alive. David Beckham Is People’s 2015 Sexiest Man AliveSorry, Matt Damon. David Beckham Took Selfies in a Sea of BalloonsArranged by his loving wife, Victoria. David Beckham Savored a Casual Acai Bowl Decked out in sweats. David Beckham Is a Tattooed Beyoncé-Jay DiehardInking a lyric. Hold Up, Nickelodeon Has Gold Slime Now?Yes, but only for super-celebs like David Beckham (and his kids). 20 Hot Soccer Guys With Long HairWhat’s sexier than a man without sweaty bangs in his eyes? F/M/K Friday: Jon Hamm, James Franco, and David BeckhamOur end of the week verdict. Male Gaze: David Beckham, Exploring the AmazonHe will star in a BBC documentary about Brazil. Some People Don’t Want to See David Beckham NakedBut only your vote can decide. Hot Men in Warm SweatersFrom Marlon Brando in a turtleneck to Kanye in a cardigan. Thousands Book Seats at Gordon Ramsay and David Beckham’s New RestaurantThe dream team sold out a gazillion restaurant seats in less than half the time it took you to read this sentence. Beckham Says Ramsay Restaurant Is a No-GoA Vegas sports bar and grill won’t happen, say Becks’s people. Happy Birthday, Victoria BeckhamPosh Spice turns 39 today. Male Gaze: David Beckham Lifted His Shirt to Show InkNo pain, no glory. 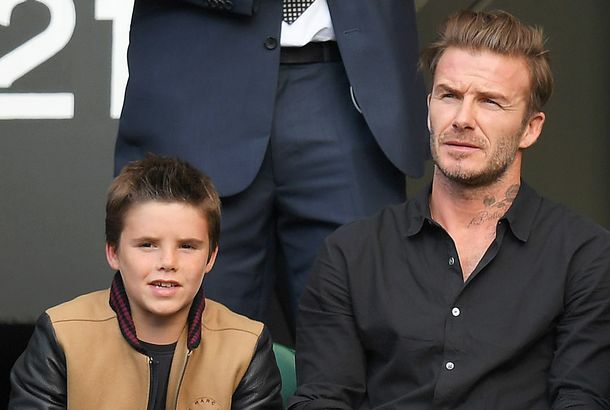 Watch Harper Beckham Watch David Beckham Play SoccerA real nail-biter, this one.